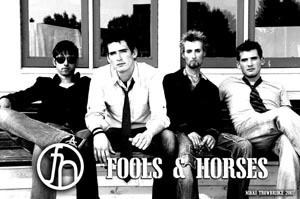 "FOOLS AND HORSES ARE BY FAR ONE OF THE BEST MID-ATLANTIC BANDS AROUND. Not only is their music tight, but they play with such passion and intensity. If you don't catch them live or get their CD, you will be missing out on a group that is destined to become a number one chart busting band!" -Dave Burgess, Promotions Director - MIX 106.5- Baltimore, MD. "Independent rock is at a kind of crossroads lately. There are bands that continue to push the envelope and find new ways to create sound and arrange songs, and then there are bands that are content to sit and idly reproduce structures and sounds that have been done over and over, run into the ground. Fools & Horses fit into the former category. The band relies on creative songwriting and even more creative sonic usage of instruments to create some of the most memorable indie rock of the year so far...The classic elements of rock are all to be found on Pop Filter, but there are plenty of components that transcend modernism and lean towards what might just be the next big thing in indie rock and all with honest credibility and aural blissfulness. A great combination."